Another One Bites the Dust? | personal.amy-wong.com - A Blog by Amy Wong. I don’t want to say it’s a sad SAD day, because I’m pretty sure there are so many worse things going on in the world right now, but I was pretty shocked to find this one out after my ISP was wonky and wouldn’t let me on Facebook and Twitter. I seriously could only use Google-based websites and the Chinese ones. 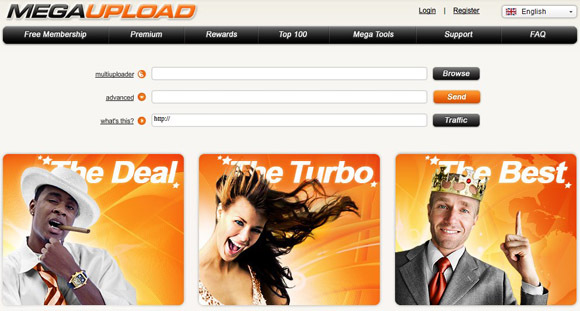 Anyway, Megaupload is dead. Or at least, dead for the moment. I wonder what people that had paid for premium accounts and had loads of files stored are going to do. It’s like… their lives are gone. PUFF! That’s it. I hope they have physical copies or other backup uploads. Could you imagine the repercussions for all those file upload systems? So uploading your iTunes backups to dropbox would be ilegal, cloud systems wouldn’t really be possible, right? And what about all those Blogger sites, WordPress and other websites that dedicate to it. Does it mean that all those sites are getting axed next? Anyway, it always happens this way. A site gets shut down, it gets bought, or something happens to it. There’s people outcry, and we move on to the next thing. 20 responses to Another One Bites the Dust? Wonder if I will ever be able to finish watching Reversal of Fate? And just when it was getting good! Sharing communities are on hold at the moment – not only because of Megaupload, but apparently they’ve also accused someone who kept a list of where to download. It’s kinda true what people say though – in theory, these things won’t hold in court. Megaupload is like a hotel where some people might do some crack… and listing download links that you did not upload or host is like telling people where to buy drugs. LOL Neither are responsible of the crime committed. It’s a shame, but I think this is the way things are going at the moment. I have visions of me being a grandfather and telling my amazed grandchildren about a time when you could just download films or albums for free and no one could do anything to stop you. I also think this is going to knock those ideas about people keeping their files on “the cloud” – remote servers – instead of on their computers. Who’s going to trust it now they know it can be taken away without any notice? Anyway, the problem with MU also seems to be that they’re being accused for money-laundering, which has nothing to do with “being an illegal site for piracy” as CNN puts it on their news reporting. Well the wests ability to watch Asian media easily, or even at all is dead. The Koreans now won’t even be able to get any money even from Dramafever because their subs were coming from the fansub community, and if the raws aren’t even around then no fansubs. Hollywood is still doomed, no matter what they do, and they just want to make sure that there is no one to replace them. Doesn’t Dramafever has it’s own subbing squad? I was sure they did. I wonder how this will affect Viki.com though. I am sure the fans will find other ways to share the raws. This is just forcing the people to find creative ways to share. Sharing won’t ever stop, it’s a system that has worked well for so many and I doubt they will give up without a fight. The future is the past. Now back to D-A for downloading, since I could get Ojakgyo Family there. Still wish I could find My One and Only You. Now off to IRC for some downloads from SARS. Dramafever has used a lot of subs fron WithS2. I know, because they left in their credits. Even think I remember some Haru2Haru subs as well. Oh, and I think I remember seeing Viki there too. Viki has an agreement with most, if not all Korean media. Problem is that the subs are legal, just not the RAWS. They will have to use Dramafever too. I agree sharing won’t ever stop, just access to the older stuff which may be gone. Heck, I still can’t find back episodes of drama’s that are still airing. No way that I wil ever likely see Reversal of Fate. I knew this was coming, It was only a matter of time…they didnt take the time to work through the loop holes like media fire. Its a shame though, i really like this site, got alot of stuff off of it. Pity~ MU really had pretty great speeds, barely any waiting time and no CAPTCHAS. Sigh. I read that what really did it was their streaming service, though. Thank the Gods for D-A. The new drama I had started finally appeared and is downloading quickly so I can start watching things again. I have D-A, SARS with IRC. I am happy once again. I am a Anarchist. The really worrisome thing is ACTA is really going to create two internets, the safe one, and the real internet. Then the real internet will become something not everyone can get. Also each country will be in a walled garden, so someone in the US can’t get access to something in China. The internet is doomed! Downloading the first episode of Shokuzai so haven’t started it yet. I don’t know what MF is doing, but simply by having your own mailserver, encrypting your email, and not keeping backups you are doing far more than Kim Dotcom and MU. What if Kim Dotcam was working for the FBI? I mean come on, can any really make as much money as he did and be that stupid? How can anyone do what he did and use gmail and not encrypt his email. This guy had to be working for the FBI or Hollywood or he had the IQ of a tapeworm. Yeah, that’s a bit stupid eh? hahaha – and the reports saying the staff exchanged download links for popular movies hahaha. What’s even more surreal was the location of the MU servers, though. That was unbelievable. yeah they cover their tracks pretty well, they tried to go after them but what media fire do is they host sites that have the download links…and they give you an option to use that download link…so they arent really hosting “illegal” content, so technically they aren’t doing anything wrong. Mega Upload hosted the “illegal” files themselves and not only provided a means to download but also charged for it too. And ive been using rapid share a long time and its very much like media fire in terms of downloading and hosting (except for the wait times) but Im not a fan of it.